Snapshot measuring 3.5 x 5 inches. This photo is undated and unidentified. But it is from the estate of Dorothy Baum, from which I have previously posted several photos. The man pictured here is Dorothy’s husband William. I was suddenly tired of black-and-white photos and needed to see something in color, but in my collection that pretty much limits me to photos from the Baum estate (or black-and-white photos with some hand tinting). I guess I need to work on expanding that category. Meanwhile, it was fun to page through those albums again. This isn’t the best shot, but I love the drama and flair of what’s presented in it. The winner is beaming with her cape, crown, scepter, trophy and roses, while the losers are barely making any effort to be gracious in defeat (except the one on the far left who is smiling as she holds her runner-up trophy). Since Mr. Baum is wearing some of his Elks regalia, I suppose that this event is somehow connected with the Elks, but I don’t know how. Since the winner’s sash reads “N.E. States & S.E. Canada”, and the other sashes (the few I can read) represent individual cities, it’s possible that the sash is another thing the winner has won. 8 Mar 2012 at 6:56 pm M.O. Thank you for posting another Baum photo! 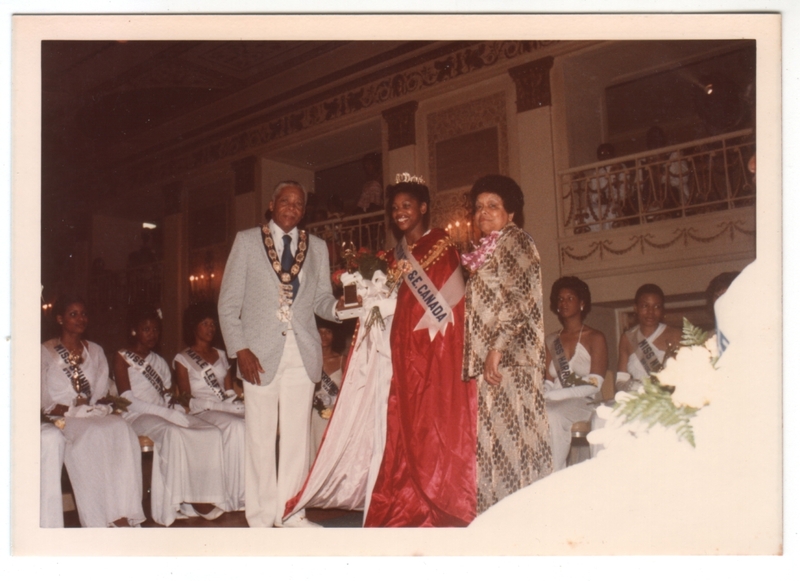 Am I correct in guessing that the lady next to the pageant winner is not Mrs. Baum? Glad you like them! And yes, you are correct. I don’t know who that lady is, and I don’t see Dorothy Baum in the photo at all. 9 Mar 2012 at 11:21 am M.O. Thank you! I always look forward to another photo from the Baum collection, especially if it was taken at an Elks or Daughters of Isis event. Well, that’s basically all I have is stuff from their events, so you’re in luck! 🙂 I actually wish I had some pictures of them in “civilian dress” to help round out the picture of their lives, but these are fun.